The riots in England, Spain and Greece, the threats of corporate and national bankruptcies as well as the wild fluctuations in stock markets should force us to rethink where we are ten years after September 11. Yes, Osama bin Laden has been killed. In a very narrow sense, a mission was accomplished. But the larger mission has not even been brought to the fore. The enemy, as it were, seems no longer to be Al Qaeda or similar groups, although certainly similar threats to security are still there and should not be ignored. We must remain vigilant. However, in another sense, the enemy, if we need to use such language, is our own Western incapacity to properly govern. The young people in the streets of Athens, Madrid and London are not afraid of terrorist networks; they are frustrated about finding jobs. People in the United States are not necessarily afraid of robbers breaking into their homes, they are afraid of someone throwing them out of their homes. The knock knock of foreclosure is more frightening than burglars; certainly it has become more frequent. In all tragic situations it is human nature to try to understand. We look to blame. We try to find root causes. At best, we can always say it was an act of God, something totally out of our control. Michele Bachmann says Hurricane Irene is a warning from God. The most difficult part of a tragedy is to look in the mirror and to see our own shortcomings. Much of the animosity behind the September 11 attacks was due to Western hubris. Much of it was due to a lack of a true international justice in a world that has become more and more globalized. If our failure to properly govern ourselves has caused domestic turbulence, the lack of international cooperation to redress gross inequalities accentuates tensions while denying the inevitability of hostile actions. Ten years after the attacks I wonder what we have learned, if anything. Why was there and is there so much animosity towards the United States? Jealousy is too easy an answer. No, as I walked the beaches of Normandy, I was struck at how grateful the people were for American leadership, generosity and sacrifice. While we cannot go back nostalgically to that situation and generation, observers of the current political campaign in the U.S. have all pointed to the lack of that spirit among the candidates. There is meanness out there, a lack of basic civility even among the candidates from the same party. The recent debates about the deficit and debt ceiling were an embarrassment to any parent trying to explain the basic rules of democratic procedure to children. David Cameron calls for more force while proposing austerity measures that will accentuate class distinctions. 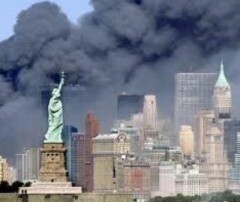 The events marking the tenth anniversary of the attacks of September 11 could be used to reconsider some of the above. While we pay homage to individuals, we should also pay respect to a certain republican ideal that seems to be fading into the past. As I wrote just following the events; "At the same time we are mourning, are we capable of analyzing the root causes of the hatred leading to the attacks? Are we capable, emotionally, to overcome the calls for vengeance to exhibit restraint and justice?" Ten years on, we should take a painful look in the mirror and listen to the young in the streets. As I concluded then, and what I believe is still relevant today, we should "try to see how our identity as the civilized world continues to have meaning".